Ukrainian banks have been banned from operating in Crimea, while Russian banks are afraid of working there because of the risk of international sanctions. As a result, ATMs on the peninsula do not work, turning citizens’ financial affairs upside-down. The authorities promise that normality will soon be restored, but for now cash is king in Crimea. Alexei Boyarsky reports from the peninsula. The closed passport control desks in the arrival zone at Simferopol airport are a reminder to Russians who have just arrived here that they are in their own country. Yet, judging by the mobile network that my phone has picked up, I am still in Ukraine. Mobile communications in Crimea are still provided by Ukrainian operators and those users who have Russian numbers will have their calls charged at international roaming rates. For the time being, Crimea is made up of contradictions like these. The cashier at the currency exchange desk at the airport tells me: "We are now operating not from a bank but under a patent issued by the Crimean government. There are no banks. And you won't be able to withdraw any cash at the airport either as none of the ATMs work." The ATMs indeed do not work: Some are just switched off; while others look misleadingly operational, and will even accept your card, but refuse to give any cash and spit the card back. 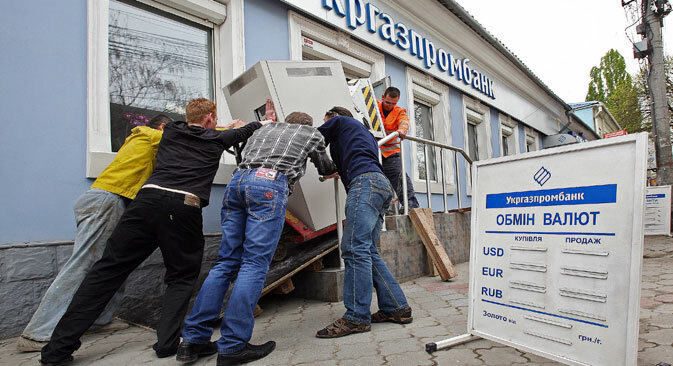 Ukrainian banks, first de facto and then officially, have stopped operating in Crimea. Under a letter from the National Bank of Ukraine (NBU), they were banned from operating in Crimea from May 6. In addition, as a former head of the Crimean branch of a major Ukrainian bank has told Kommersant-Dengi, under the law, the residents of Crimea, who have now become foreigners as far as Ukraine is concerned, cannot be served by a Ukrainian bank unless there are some additional circumstances, like a residence permit. According to him, NBU has banned any payments to residents of Crimea and any settlements with Crimea. As a result, money left in Crimeans' deposits has simply been frozen, as the banks have no right to return it. People who want to return money to Ukrainian banks under earlier loans are unable to make their payments from Crimea either. The former bank head estimates that Ukrainian banks owe Crimean residents some 50 billion rubles ($1.5 billion), with an approximately equal amount owed by Crimean residents to banks under the terms of loans. Mikhail Andrianov from Yevpatoria and his wife have been saving money for a flat for four years by putting aside part of their monthly pay in a current account with Privatbank. They have already saved 260,000 hryvnias (about $26,000) and were planning to buy a flat this year, but in March their account was blocked. The bank told Andrianov that he would be able to get the whole of his deposit back if he came to Ukraine and registered with the Ministry of Social Policy, where he was to be issued with a certificate proclaiming him "a temporarily displaced person". Andrianov is at a loss: "This is not an option for me. I live in Crimea and have no intention of moving anywhere." Andrei Zotov from Simferopol had a dollar account (some $5,000) with the Credit Agricole bank. He recalls: "I came to the bank a week before the referendum. They told me: Don't worry, we operate in Russia too." However, a month later Zotov received a text message on his mobile phone notifying him that the bank no longer planned to operate in Crimea. He managed to close the account and get his money back, though the deposit was returned in hryvnias instead of dollars, at a low exchange rate and in instalments of not more than $1,500 a day. Andrey had to come to the bank for a week and spend hours in queues as by then the bank had only one branch left open in Crimea. Do these loans need to be repaid at all? Before May 6, some banks, mainly Ukrainian subsidiaries of foreign banks, did return money to their depositors in Crimea. I was told of how somebody withdrew money with an OTP Bank (a Hungarian bank subsidiary) card from an ATM installed on a boat in Sevastopol. However, the Bank of Russia too, and independently of NBU, began to issue formal resolutions on ending the operations of bank subsidiaries in Crimea. On the basis of these resolutions, obligations to depositors should be honored by the Deposit Insurance Agency, returning deposits of up to 700,000 rubles ($20,000). The Deposit Insurance Agency in Crimea is represented by a Depositor Protection Fund set up especially for the purpose. So far, the list of banks whose depositors the fund is working with has the names of only 10 banks on it but this list is to be expanded. According to the first deputy prime minister of Crimea, Rustam Temirgaliyev, the fund has already received over 75,000 applications, with 6,500 of them having already been accepted, worth a total amount of 880 million rubles ($25.3 million). Incidentally, the only ATMs that I used in Crimea that allowed me to withdraw cash on Russian and even American cards belong to a bank from the Krasnodar Territory, the Russian region nearest to Crimea, separated from the peninsula by the Kerch Strait. The author would like to thank Vadim Nikiforov for his help with this article.